The ancient Chinese sages searched for perfect balance in mind, body and spirit and created a method for measuring this balance, Yin and Yang. Beauté Chinoise has drawn from the wisdom of these ancient Chinese sages and created a range of precious oils - The Yin & Yang Collection. Essential oils have been used in Oriental and Chinese Medicine for thousands of years as the Ancients recognised their healing benefits and assigned an energetic quality to each oil. Today we know that organic plant oils are the most effective carriers for delivering essential nutrients to the skin. 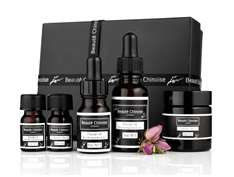 Beauté Chinoise's luscious oils and teas are blended using only the finest ingredients. Hand blended, they embody the definition of luxury and bring balance to the skin, spirit and emotions.